When combined with the savings I had last week (Spent less than the $87.50 allotted for each week), I am still good with the budget. This week I didn't use very many coupons and a lot of the sales I took advantage of were not BOGO (50% off). I stocked up on some beef, since we have chicken already at home. One thing I can never turn away from is those Stoffer's Family Size Meals. They go on sale for $3.99 (usually $6.29) every once in awhile, so I like to get them then because they are great for when you have guests or just don't feel like cooking a meal (pop them in the oven and they are done!). This was also my first week ever getting a rain check. I got to the store later than I wanted to (spent too much time at Walmart) and some of the sale items I wanted were out of stock (especially one that would have given me overage). 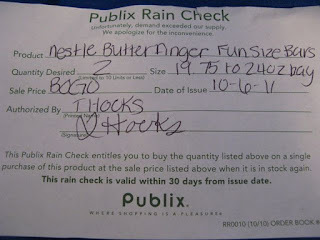 So I thought today was the day to try out Publix Rain Checks. You just go to customer service with the ad and tell them what things you want and how many. 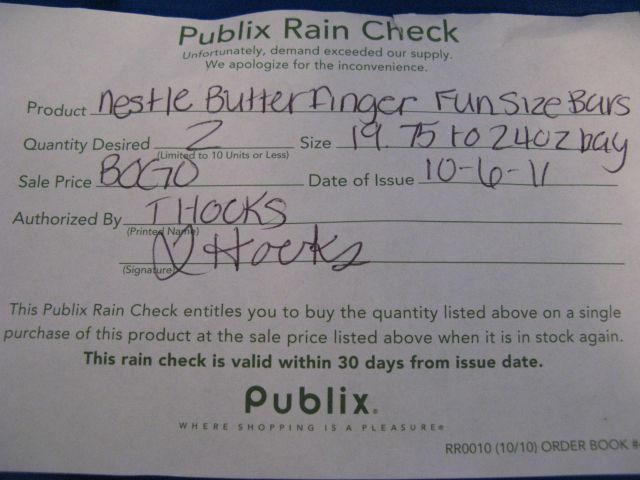 They write you up a rain check that is valid 30 days after the issue date. So, if you have coupons that aren't expiring soon you can just wait until the product is back in-stock and get it then. Hopefully everything I wanted will be in stock next week! Instead of writing everything out that I got, I took the lazy route and made a video. All my coupon match-ups for the week were found HERE at Southern Savers. Have a fun time saving this week!